I'm getting soft. For a while, I couldn't really stand the whole new wave of "natural world"-themed black metal. I outlined the depth of my hatred in a review of Wolves in the Throne Room's Celestial Lineage, but, after mulling down to it, it all really boiled down to the feeling of exclusivity. You know, the kids with ripped up pants telling other people that they weren't "truly" playing black metal because they didn't pocket compost. Looking back, it's pretty funny that this got to me as much as it did. I was able to enjoy "tr00 christraping war metal," even with the multitudes of hilarious "Satanic overlords" (did anyone see some of the getups at the first Cathedral of the Black Goat fest last year? Jesus. ), but, for some odd reason, a bunch of idealistic crust punks who liked to bring elements of neocrust into black metal really, really got me going, enough to where I avoided the style altogether. I know, immature and stuff, but the gradual chipping away infuriated me, much like the gradual burn a father hears as his children repeat "Are we there yet?" ad nauseum. 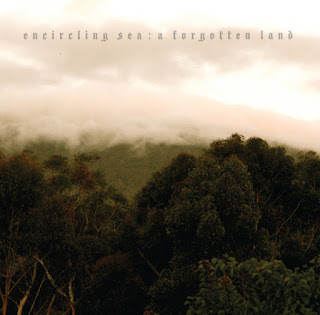 In my silly protest, I ended up forcing myself to not listen to quite a few unique and compelling bands, unfortunately including Australian black metal act Encircling Sea, whose I and Ecru were constant listens. A Forgotten Land makes me glad I've since grown up. The third chapter of Enclircling Sea's discography is a continuation of the sound they had presented on 2010's Ecru - an eclectic mix of post-rock, sludge, black metal, and folk, based largely in vast, atmospheric expanse, though A Forgotten Land pushes the majestic black metal influence further into the foreground. A collection of four lengthy tracks, totaling almost seventy minutes in length, A Forgotten Land opens with the ethereal, trudging doom of "Yearn," which flows seamlessly into a flowing stream of low-end black metal and beautiful ambiance within its eighteen minutes of existence. Front man Robert Allen's gruff singing voice makes a fitting entrance in a particularly powerful buildup, leading into a mid-paced, almost post-punk-inspired dual guitar harmony. "Transcend" follows a similar progression, constantly building ontop of itself, much like climbing a seemingly never ending mountain; the length seems daunting, but the culmination makes the journey worth it. At ten and a half minutes in length, "Become" is the shortest offering on this album, but it is by far the most memorable. With "Become," Encircling Sea more than effectively morphs into a neofolk band, melding their tasteful post-rock mentality with delicately strummed acoustic guitars, bowed string instruments, and a beautiful vocal duet between Robert Allen and his wife Ramanee. I first listened to this album on a long bike ride, and it was with this track that A Forgotten Land and I really clicked, fitting perfectly with my snow-flecked rural surroundings. I might have disliked the whole "nature metal" thing before, but when you listen to it in the right setting...things begin to make sense. The perfect foil to its neofolk predecessor, A Forgotten Land closes with the mighty "Return," a twenty-minute adventure through some of Encircling Sea's most aggressive material to date. While still based in the band's trademark majestic scope, the pummeling nature of its bottom-heavy doom and break-neck black metal highlights this four-piece's ability to match their soaring heights with grimy, harsh depth. Keeping their harshness in check with acoustic interludes and layered clean voices, "Return" is the culminating point of A Forgotten Land, merging each point of influence into its densest form, presenting Encircling Sea's aim at its clearest. Encircling Sea's massive return is as welcome as it is enjoyable. A beautiful demonstration of nature's might, A Forgotten Land's pastoral mix of dreamy sludge and atmospheric black metal is one of the most impressive offerings in its musical "scene." Replenish Records has graciously made A Forgotten Land available for a "pay as you want" download, with any digital proceeds going directly to the Still Wild Still Threatened charity. Of course, if digital isn't for you, it is also available as a double LP and CD, both limited and definitely worth the dough. It's albums like this which make me wonder why the hell I even bothered getting so worked up before, but this refreshing return makes it all the more worth it.